120 changes each of Winchendon Place, St Nicholas; 240 of Reverse Canterbury Pleasure; 120 each of St Simon's, St Martin's; 240 of Plain Bob and 300 of Grandsire. Last updated Thursday, 12 April 2018 at 11:29:34. First submitted Monday, 9 April 2018 at 10:58:56 by Alison R Williams. 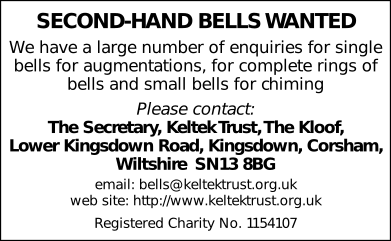 Sent for publication in The Ringing World on Monday, 7 May 2018 at 00:36:37, and printed in one of issues 5588 or 5589.